Willis Newson has collaborated with Macmillan Cancer Support to devise and deliver a public art plan for its new information and support centre in Brighton. Macmillan Cancer Care recognises the value of art in healthcare, and the role art can play in creating healing environments. It seeks to harness the skills of artists and uses well-chosen and high quality artworks to humanise and personalise cancer environments. The aim of this project was to enhance the experience of people whose lives are affected by cancer by delivering a high quality, appropriate environment. It aimed to achieve this by integrating artwork into the fabric of the building to create a real sense of identity for the space as a welcoming and primarily “non-medical” place of refuge and respite for patients visiting the cancer centre. Artist Kate Blee was appointed to work on the project with a brief to create artworks which would bring a strong sense of identity to the centre and would welcome, distract and calm visitors. 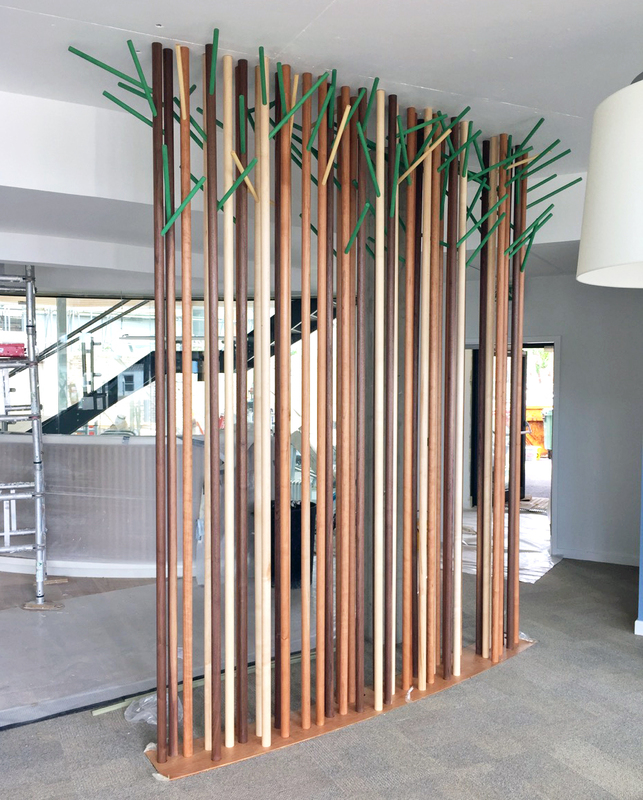 Kate produced a Japanese-inspired design for a timber screen made using different natural woods, sited in the reception area and installed in June 2016. The result is a fine, elegant, dynamic intervention into the space that offers beauty in the natural timber, a strong sculptural form and a changing compositional rhythm as you move round it, casting shadows in different light conditions.